Weight Loss Myth # 1 – Not eating will help me lose weight faster. There is no truth to this whatsoever. Sure, you have to eat fewer calories if you want to lose weight fast and your body would essentially lose weight faster, but it won’t be the type of weight you’ll want to lose. If you cut too low on your calories each day, your body is going to start burning muscle for energy – not fat! So while you’re losing weight, your body is turning into soft, weak and pudgy and this is not good if your goal is to look your best. Not to mention, diets that drastically cut calories in an effort to lose weight can have a very negative impact on your health as well. Your metabolism will also slow down, making fat loss even harder and making it extremely easy for your body to regain lost weight after you come off of the fad diet you are on. Tip: Never eat fewer than 1000 calories below your maintenance level each day – or the amount of calories it takes to maintain your body weight. 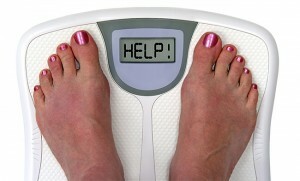 In addition, you should strive to lose a maximum of 2 pounds per week, but no more than this. Another thing you should consider is weightlifting. Not only can this help you gain muscle fast, but it will also help you maintain the muscle that you do have when you’re trying to lose weight. Weight Loss Myth # 2 – I can eat whatever I want as long as it’s healthy and I will still lose weight. It doesn’t matter what kind of foods you eat, if you eat too many of them, you will gain weight. You could eat nothing but celery sticks and carrots all day, but if you eat too many of them then your body will certainly store the remaining calories as fat. It’s all about calories in vs. calories out. In fact, this is really the only thing that matters when it comes to weight loss. Just because you’re eating healthy all the time does not mean you will lose weight faster – if you consumed nothing but sugar all day long but ate a calorie deficit, you would still lose the same amount of weight that you would lose if you were eating healthy. Having said this, eating healthy foods will still make it easier to lose weight and is recommended, since your body needs high quality nutrients to function properly and these high quality foods will keep you fuller for longer periods of time, resulting in a decreased appetite and more weight loss. Always make sure you’re eating the right balance of whole grains, lean proteins, healthy fats, fruits and vegetables to lose weight fast. Weight Loss Myth # 3 – I work out regularly so I can eat whatever I want. This myth is somewhat twisted because there is actually some truth to it. The more you exercise, the more calories you will burn and this means that you will be able to eat more without it being stored as fat. But you need to make sure that you don’t go overboard. Would it really be necessary to eat an entire pizza by yourself because you went for a 20-minute jog earlier? Of course it wouldn’t! Brisk walking or jogging for 20 minutes might burn 100-200 calories, but an entire pizza could contain anywhere from 600-2000 calories! Or beyond! So although you might be able to eat a little bit more, it doesn’t mean you can stuff your face with whatever you want – you need to know your limitations. Avoid these 3 weight loss myths and you will be good to go. Weight loss is only difficult if you make it difficult and by avoiding these myths you will be on the path to success in no time. Great post! These three myths explained really sum up the top questions I get from clients regularly. I tend to agree with most of what you describe in your post except where you say that if all you ate was sugar but at a deficit you’d still lose weight. This is not necessarily true. Sugar gets stored as fat. Just as you say you may lose weight by eating too few calories but it wouldn’t be the kind of weight you want…this would be true too if you ate sugar at a deficit. You’d get fat pockets in particular spots on your body and look horrible. So yes the in vs. out makes sense but the other part of the equation is you are what you eat.